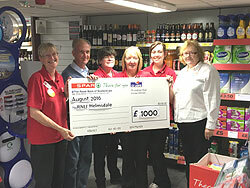 SPAR Helmsdale recently made a large donation of £1000 to the Royal National Lifeboat Institution (RNLI). Donations like this allow the RNLI to keep providing their on call, a 24-hour lifeboat search and rescue service around the Helmsdale harbour area. The money SPAR Helmsdale donated was raised through the sale of single-use carrier bags, which since October 2014 cost customers 5p per bag and was then collected and donated to a local charity’s and groups within the community like the RNLI.